I have been coding little application to make adding task in iCal fast and comfortable. I finally have a binary release today. Check out QuickTask here. I find entering task using standard dialog provided by General Calendaring application quite uncomfortable. The dialog feels very "noisy" to me. I understand that most of them aim to enable user utilize ical-file standard as much as possible but for my usual use it's too bloated. 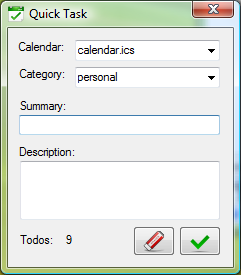 I made quicktask to make entering task to calendar more fit to my task-adding style and many others I think, especially GTD-follower who don't bother with dates, times and prioritizing task (at least when entering them). It can be viewed as a facade to ical's task i.e: utilizing ical framework but only deal with stuff that match to our conceptual use of it. I have been using for sometime now and hopefully it will be useful for others too. switch to the "SVN" tab. I think it's pretty nice and easier compare to using separate command line client with which you need to go to console, go to that directory and type "svn info" (not to mention the hassle of installing the svn command line client). It's not that apparent for people who used to the command line command though although it seems quite consistent with how explorer arrange things i.e: Properties dialog is where the info about the selected item shown. However, I think having some way in the main context menu of TortoiseSVN to show this info will feel straightforward and and natural for some people. info command is used just like update, commit and other typical command so they would normally expect to find it on the same place where they see those other common command. If you use Subversion with Visual Studio chances are you have been in a situation where a file you added in VS and you forgot to "svn add"ed it, thus not committed to subversion. Things will still be ok on your side, you probably only aware of this when someone else shout "Hey, who broke the build ?!". It's where the AnkhSVN come in. I still use TortoiseSVN for my main svn client but I also use AnkhSVN to avoid the case above. 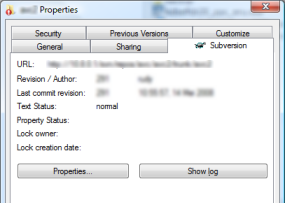 When I add stuff, it automatically "svn add" it. Another important use of it for me is the instant review of what's changed from within VS and the simple way to revert changes without having to go to the windows explorer and access TortoiseSVN from there. In short, I think it's a good complement for main svn client although not to replace it.